Both MCRD San Diego and Parris Island have a Support Battalion which functions in several capacities for each Depot. Included in the companies for this battalion is the Special Training Company (STC) which is the company recruits are assigned to should they need to be removed from the standard Recruit Training Battalion (RTBN). This could happen for a variety of reasons including but not limited to recruits who need medical rehabilitation (MRP), physical conditioning PCP) and/or evaluation (EHP). The mission of the Support Battalion is to provide subject matter expertise in direct support of the Recruit Training Regiment and its overall mission of transforming civilians into basically-trained Marines. (a/k/a Receiving Company at SD) responsible for entry-level processing all recruits once they arrive on the depot as well as those recruits recommended for separation prior to completing training. MRP is a part of the Special Training Company (STC), which is made up of four platoons, PCP, MRP-1, MRP-2, and BMP. MRP-1 is for lower body injuries, and MRP-2 is for upper body injuries and illnesses/infections. Once a recruit has healed they will move from MRP to PCP prior to returning to training. Recruits may become ill or injured. Your recruit will be given the best medical care available, with doctors and teams of hospital personnel to assure your recruit is well-cared for and gets the medical attention he or she needs. There will be no expense to the recruit for medical procedures or prescriptions. He or she will continue to receive full pay for time spent in MRP. The Medical Rehabilitation Platoon, or MRP, is the platoon that recruits are assigned to if they are injured or become ill during recruit training. You may get a short phone call from your recruit if he or she has been assigned to MRP and you'll certainly have additional questions at this time. Your best source for official information about a recruit in MRP, particularly if he or she has just been assigned to MRP, is your son or daughter's recruiter. In situations where your recruit is facing an extended recovery time, you may be given a contact person at the Depot. You may also be given a new mailing address to send mail to. For extended stays in MRP, small care packages with appropriate items are acceptable. The situation faced by each recruit in MRP is unique, depending on the length of time spent in recruit training thus far and the severity of the injury or illness. Remember, we are not the Marine Corps and cannot cite Marine Corps policy or procedure, but we can provide you with resources and the opportunity to speak with others who have endured similar situations. 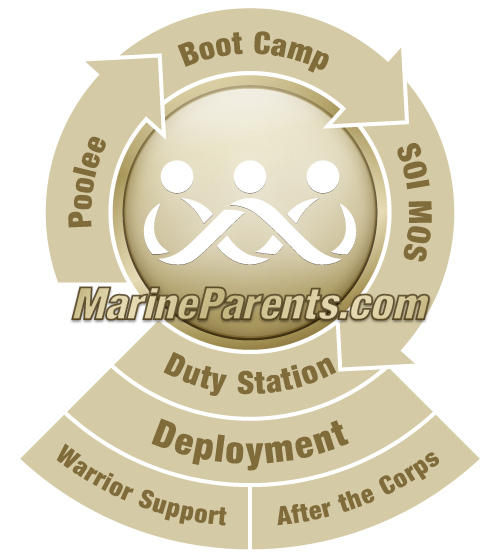 We have an Official MarineParents.com Facebook Group that is specifically for family members of recruits who have been moved to a platoon in the Special Training Company, whether for illness, injury, conditioning, evaluation, or separation. The group allows family members to communicate concerns with one another, as well as ask questions of our trained volunteers. To join the group, you must have a recruit who has been placed in one of the Special Training Company platoons. There are three questions you need to answer to join the group. You need to respond to all three questions, please. If you are unable to join our Support Battalion Facebook Group, you may contact our corporate office for additional information and support. Please visit our contact page https://www.MarineParents.com/Contact.